Mile 60.5 - A view of Hilltop House from the towpath. After about 30 miles of "remote" wilderness, things start to get crowded as the canal enters the Appalachian Mountains. In the narrow valleys, river, canal, railroad, and highway must compete for limited real estate. During the early 1800s, the canal and railroad companies were constantly involved in legal battles surrounding these right-of-ways. In some of the tighter sections, you will note that the railroad has since taken over the abandoned canal bed. Mile 51.5 is the site of the Catoctin Creek Aqueduct. This aqueduct completely collapsed several years ago and has since been replaced by a footbridge. A few miles past, you enter the Brunswick, MD area. This town contains a small railroad yard and an RV campground along the river. The towpath is typically quite bumpy here, since traffic uses it to access the campground. Route 17/287 also crosses the Potomac here at mile 55. This road runs south to Purcellville, VA (via Lovettsville) where you can catch the western terminus of the W&OD Trail. However, Route 287 is not very cyclist friendly (fast traffic and no shoulder). Instead, I recommend you use one of the very nice country roads to the east or west of Route 287. Look for the State Road 663 intersection, about 1 mile south of the river. At mile 58, a red brick lock house marks the point where the Appalachian Trail (AT) joins the towpath. As you may know, the AT is a hiking trail that runs some two thousand miles between Maine and Georgia across the top of the Appalachian Mountain Chain. After making the short hop across Maryland, the trail comes down off the ridge for a three mile "stroll" along the Potomac. At mile 61, the AT crosses over the river into West Virginia at Harpers Ferry. The highlight in this section is the town of Harpers Ferry, located at the fork of the Potomac and Shenandoah Rivers. This town, now a National Historic Park, has a long history of floods and wars. A walkway along one of the railroad bridges provides easy access from the canal. On both trips, I stayed at the Hilltop House, which has a restaurant and a wonderful view of the valley. (only some rooms have TVs, so specify if you would like one). The less expensive alternative is the Comfort Inn. The ten mile section upstream of Harpers Ferry is one of my favorite sections. This area played a big part in Civil War history. The John Brown abolitionist revolt at the Harpers Ferry Arsenal was credited as one of the major events leading to the Civil War. Several years later, the Union and Confederate armies fought the bloodiest battle of the war at Antietam Creek just outside Sharpsburg, MD. This section makes a great day trip for the whole family. It is only about an hour drive from Washington. The towpath here is typically in good shape. After biking for a few miles, you can march over the river and check out the historic section of Harpers Ferry. This is also a nice hiking trail to the top of the Maryland Heights cliffs overlooking the town. 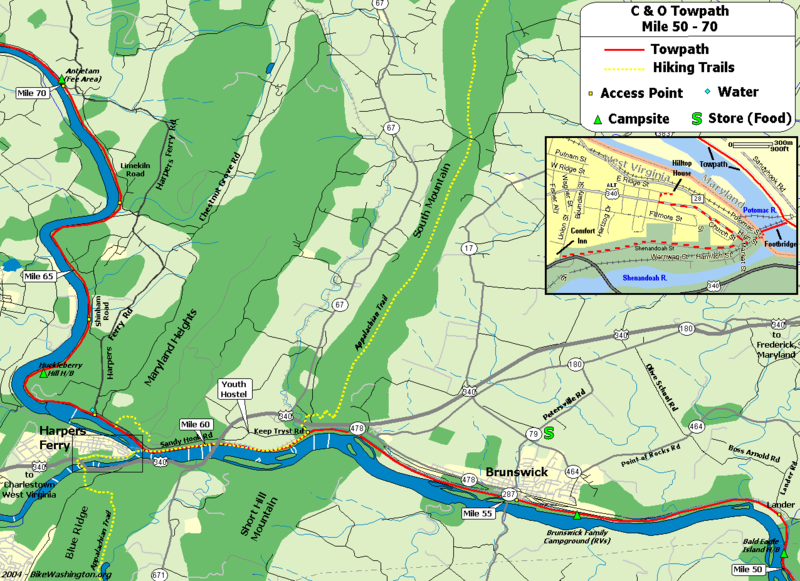 At Frederick, follow Route 340 South toward Harpers Ferry. After about 10 miles on Route 340, take the Route 17 Exit for Brunswick. Route 17 will bear right at a traffic light. Upon entering the town, follow the traffic circle almost all the way around. Exit at "A-Street"
Once on "A-Street", bear to the right and cross over both sets of railroad tracks. Parking is available under the bridge, or back in the large commuter lot located between the railroad tracks. Where Route 340 becomes two lanes, look for left turn onto Keep Tryst Road (just prior to Potomac Crossing). Follow Sandy Hook Road down the hill, under Route 340, and past the town. Small parking areas are available just past the railroad bridges/tunnel, across the river from Harpers Ferry. 64.9: Dargan Bend Recreation Area. Continue to the end of Sandy Hook Road. Becomes Harpers Ferry Road at sharp up-hill turn. After about 1.5 miles, make a left onto Shinham/Back Road. 67.0: Mountain Lock Recreation Area. Continue along Harpers Ferry Road, passing Shinham/Back Road. At Chestnut Grove / Hoffmaster Road intersection, bear left to remain on Harpers Ferry Road. At bottom of second hill, make right onto Limekiln Road. Parking area is at bottom of hill. Continue along Harpers Ferry Road, passing Limekiln Road. Soon after crossing narrow stone bridge, make right onto Canal Road. Parking area is about 0.25 miles off Harpers Ferry Road. 51.5 Catoctin Creek Aqueduct The number 3 aqueduct is noted for the unusual center arch. It completely collapsed in October 1973. The beautifully restored aqueduct was completed in 2011. 60.7 The Outfitter At Harpers Ferry (map) 304.535.2296: General Store location (near railroad station) offers bicycle rentals and basic bike parts (such as tubes). Full service hiking equipment on block up the hill.